What did Jesus mean when He said He is the Vine? Dr. Fleming: This is a vineyard watchtower. 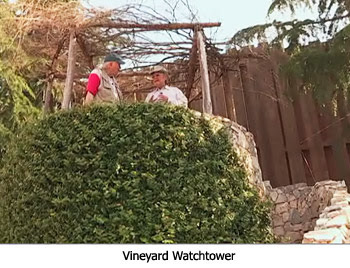 Dr. Reagan: Why do you need a watchtower in a vineyard? Dr. Fleming: In vintage season when the grapes are out, someone is sure to try and steal them. It's not only that the animals will trod on them. Because of this, the vine dresser and family slept in the watchtower. The season for grapes is at the end of the summer, so you don't need a permanent roof. You only need shade. You stay overnight in there. We've made a vineyard here, but did you notice that there is no wire holding up the vines? In antiquity it was a very different way of growing the grapes. Dr. Reagan: Of course they didn't have wires in Bible times, but they didn't just let the grapes grow on the ground, did they? 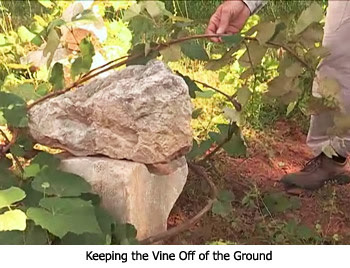 Dr. Fleming: Yes, but every vine has a couple of rocks next to it to keep the vine off of the ground. Now here's the thing, you have to keep lifting the branches up onto the rocks as they get further away because if the vine touches the ground it will make a root at that point. Then what happens is the vine will wither its connection with the deeper root of the mother vine. Then we get five months of no rain: May, June, July, August, and September. In Judea grapes come out August/September, causing a vine with a secondary root to wither. With this in mind, let's go back to Jesus saying at the Last Supper, "I am the vine, you are the branches, abide in me." Everybody then knew that if you didn't keep the vine off the ground it would make its own nourishment and stop growing. Isn't it interesting that Jesus' last saying to His disciples was to keep our nourishment in life based upon Christ's deeper root? It is Jesus who will hold you up through the spiritual droughts in life. Did you know the same word for "take away" in Greek is "lift up"? In fact, three out of four times it is translated "lift up." Instead of understanding Jesus to be saying that any branch that bears not fruit He will take away, three out of four times that word means, "I will lift up." Do you see how if you're all the time stacking branches up onto rocks, it is a very different feeling to what Jesus is teaching, isn't it? Between take away and lift up, He's saying He'll help you keep your nourishment based on His deeper root. 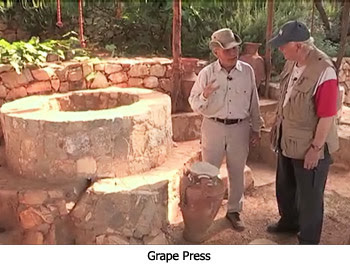 Dr. Reagan: Once again, understanding the culture's farming methods helps us to better understand the Bible. Dr. Fleming: I think if more translators would see an ancient vineyard without branches already up on wire they may have thought of translating the meaning as "lift-up" instead of "take away." Dr. Fleming: We are now at the place where you would bring your grapes from the vineyard. To crush the grapes, a person holds onto ropes on either side of the stomping vat. That's so you stomp with two points instead of three points, if you know what I mean. Dr. Reagan: So, the vineyard workers hold onto the ropes and stomp with their bare feet which are hopefully clean? Dr. Fleming: Hopefully! They stomp inside the vat. The reason they took off their sandals is because the juice would be a little bit sour with the pits being scraped open. The grape juice then dribbles down into a collection vat. What is very interesting to me in the imagery in the Bible of the stomping vat is the image of judgment — the grapes of wrath. You hear a cadence on two occasions while you are stomping on the grapes as if an enemy army is marching. So, picture that and remember Jesus' phrase, "trodden under the foot of the Gentiles." The bowls of judgment are from crushed grapes. In contrast, the collection vat is a symbol of joy, because the grapes come out at the end of the summer just when your water cisterns are drying up. Instead, the Lord gives you the fruit of the vine. So, for Jews that overflowing cup of wine means, "My cup overflows with joy." Dr. Reagan: When you take the grape juice and put it in the collection vat, you have to strain it? Dr. Fleming: Yes, you must use a linen cloth. Remember Jesus saying that some religious people strain a gnat and swallow a camel? There are all sorts of flies, gnats and ants at the end of summer, so you must strain them out of the juice. There were even some Pharisees during the time of Jesus who wouldn't trust that the wine was properly strained. When they'd come over for dinner before the fruit of the vine was poured into their cup, they'd bring out a linen cloth and put it over the cup and strain it themselves again so as not to accidently eat anything the Levitical Law considered unclean. A gnat is unclean, just as a camel is unclean. We've all met people who were worried about a gnat, but they swallow camels every day over things like peace and justice issues. Do you see the comparisons Jesus was making? Dr. Fleming: We are now where we press olives. Understand that you would have baskets or sometimes sacks held up by stones in the back. A large stone is made ready so you can really have a flat surface. Dr. Reagan: The olives are put under the stone on top and then you'd hang weights on the beam that holds the stone down? Dr. Fleming: Notice there are places to put more than one weight. We just have a second weight on right now. Usually a weight is as big as two people can lift up. Imagine as you put the weight on seeing the olive juice running down the sides and then into a collection vat for the olive oil. 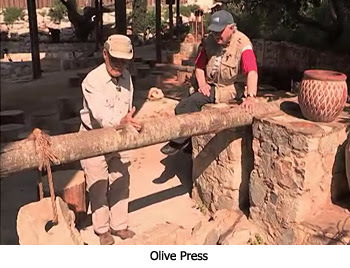 What is interesting is that this oil press is called, believe it or not, a gethsemane. Geth means press and semane means oil, so "pressed oil." Therefore, Jesus liked to pray at a garden called The Garden of the Oil Press. If you ask anyone what do you picture when you picture an oil press, they'll say liquid running down the sides and something getting flatter and flatter under pressure. So, I think the imagery is there. Jesus feels pressed in The Garden of the Oil Press. With four different weights there can be four different grades of olive oil. When you put the first weight on, that's called the first pressing for the virgin oil, which is used for religious purposes. It's for anointing the sick. It's for the menorah in your synagogue with the special seven day ceremony used in the lamp stand in the Temple. After you cupped the virgin oil all up, then you'd put the second weight on. That becomes the largest press which is used for cooking and eating. After taking the cooking oil away, you'd add the third weight. The third press is a little bit bitter, so it is for your oil lamps. You'd have a place for the wick in your lamp and you'd pour the oil in the top. The fourth and final pressing is to make lye. Lye is used for soap. We joke about Palmolive soap, but palm and olive oil are actually used in soap. Isn't that amazing? Olive trees have so many uses that the people in Bible times would see them as beautiful trees. The book of Hosea says, "Like as an olive tree to a beautiful tree." In terms of olive wood, the doors of the Temple were made of olive wood. Then they got healed with anointing oil. For cooking, they had salad oil used for eating. Today we can use olive oil to generate electricity which provides lighting. It's used to make soap. So, the olive tree truly makes for a beautiful tree. 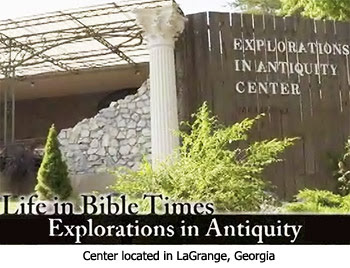 In the sixth part of this series with archaeologist Dr. James Fleming at his Explorations in Antiquity Center, we'll glean some biblical insights by learning what in Bible times life was like at the city gate.